Welcome to the 3rd edition of the Caption Task! Consequently, there is a considerable need for automatic methods that can approximate this mapping from visual information to condensed textual descriptions. The more image characteristics are known, the more structured are the radiology scans and hence, the more efficient are the radiologists regarding interpretation. We work on the basis of a large-scale collection of figures from open access biomedical journal articles (PubMed Central). All images in the training data are accompanied by UMLS concepts extracted from the original image caption. The first step to automatic image captioning and scene understanding is identifying the presence and location of relevant concepts in a large corpus of medical images. Based on the visual image content, this subtask provides the building blocks for the scene understanding step by identifying the individual components from which captions are composed. The concepts can be further applied for context-based image and information retrieval purposes. Evaluation is conducted in terms of set coverage metrics such as precision, recall, and combinations thereof. This task will be run using a subset of the Radiology Objects in COntext (ROCO) dataset . image - caption pairs were extracted. 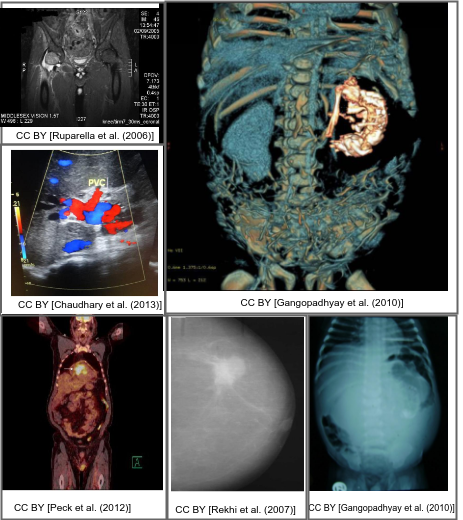 To focus on radiology images and non-compound figures, automatic filtering with deep learning systems as well as manual revisions were applied, reducing the dataset to 70,786 radiology images of several medical imaging modalities. NOTE: If the usage of an additional source for training is intended, it should not be a subset of PubMed Central Open Access (archiving date: 01.02.2018 - 01.02.2019), to avoid an overlap with the test data. The ground truth for the test set was generated based on the UMLS Full Release 2017AB. O. Pelka, S. Koitka, J. Rückert, F. Nensa und C. M. Friedrich „Radiology Objects in COntext (ROCO): A Multimodal Image Dataset“, Proceedings of the MICCAI Workshop on Large-scale Annotation of Biomedical data and Expert Label Synthesis (MICCAI LABELS 2018), Granada, Spain, September 16, 2018, Lecture Notes in Computer Science (LNCS) Volume 11043, Page 180-189, DOI: 10.1007/978-3-030-01364-6_20, Springer Verlag, 2018.